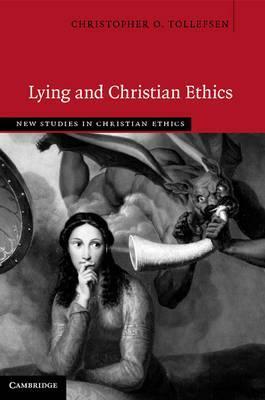 Lying and Christian Ethics defends the controversial absolute view of lying, which maintains that an assertion contrary to the speaker's mind is always wrong, regardless of the speaker's intentions. Whereas most people believe that a lie told for a good cause, such as protecting Jews from discovery by Nazis, is morally acceptable, Christopher Tollefsen argues that Christians should support the absolute view. He looks back to the writings of Augustine and Aquinas to illustrate that lying violates the basic human goods of integrity and sociality and severely compromises the values of religion and truth. He critiques the comparatively permissive views espoused by Cassian, Bonhoeffer, and Niebuhr and argues that lies often jeopardize the good causes for which they are told. Beyond framing a moral absolute against lying, this book explores the questions of to whom we owe the truth and when, and what steps we may take when we should not give it."